Just Jingle: It's the First Saturday in February and that means a Brand New Stampendous! Challenge! It's the First Saturday in February and that means a Brand New Stampendous! Challenge! 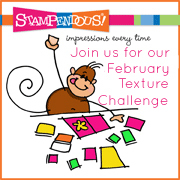 The first Saturday in February means it is time for a brand new challenge with Stampendous! This month we are challenging you (and ourselves) to add a little texture to your projects. Need a few ideas? You can emboss using enamels or powders, use fun flock, glass glitter, mica fragments, color fragments, or use some embossing folders. The possibilities are endless! And here is my card for this week! I used the wonderful Charm Collection Perfectly Clear stamp set and the amazingly fun Aged Rose Embossing Enamel for my card! Due to shipping restrictions, the winner must have a US address. We hope you get a chance to play along with us - happy stamping! And make plans to join us next Saturday, for a fun blog hop, complete with prizes you don't want to miss. We'll be showcasing all sorts of products just released at CHA! Beautiful subtle color and amazing texture! Love the window for the corset! The embossing enamel is a nice touch. Very cute! Love the embossing around the corset! So unique! Love the small frame with the encrusted areas. wow, it is just gorgeous, love the folded back paper! I meant to get to you earlier today, but it's been one of those days! You won my giveaway! If you could email me your address, I'll get everything sent off to you next week! Hope you're having a wonderful weekend, and I'll talk to you soon! Ohhhh, this is really pretty! 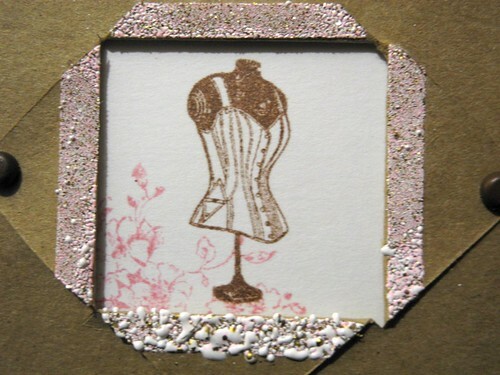 Love how you framed the image with the embossing powder and the soft colors.